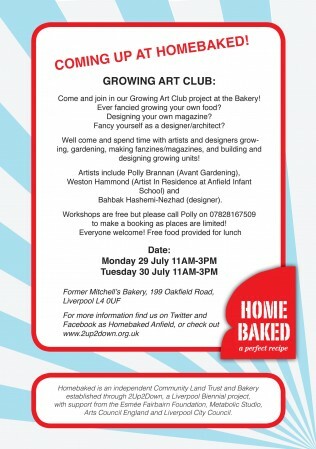 Please join artist Polly Brannan from Avant Gardening (http://avantgardening.org/home/) for an informal discussion about projects she has been involved with around gardening, local environments, play and public spaces. Polly will be joined by Weston Hammond, artist in residence at Anfield Primary School who will talk about the gardening project he and his students have been working on. This event is part of a series of talks organized in collaboration with Liverpool Biennial and will form a basis for ideas and discussion around a Homebaked growing project with local residents. There will be plenty of room for discussion and sharing of knowledge. We will offer freshly baked Pizza. If you grow your own food, bring some vegetables for toppings!